By now, everybody knows that recycling is not only a good thing it also helps lessen our carbon footprint and makes our earth a cleaner place to live. It saves our valuable landfill space. It helps reduce greenhouse gas emissions. It allows for waste to be made into valuable products that take on a new life. Recycling is good…for people… the planet…and even your pockets! What you might not know is just how many ways tires (that have reached the end of their effectiveness) can be reused. Recycled tires are finding a new home in communities across Ontario! In fact, new products derived from recycled tires create more economic activity while reducing the waste stream without generating excessive pollution and emissions from recycling operations. Did you know that recycled tires are used in many different construction applications, entire homes can even be built with them! 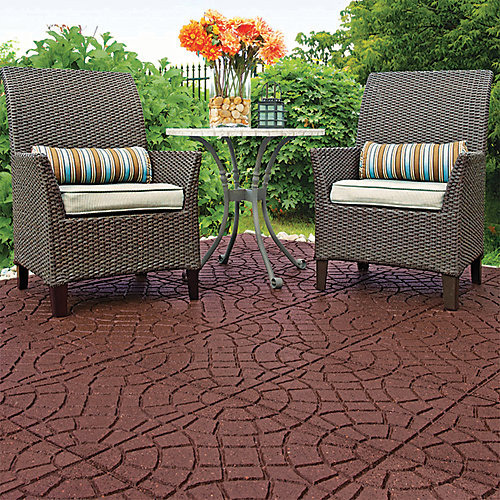 Many landscaping materials such as mulch and patio pavers are made from recycled tires. But that’s just the beginning. Recycled tires are used in civil engineering applications such as sub-grade fill and embankments, back-fill for walls, rubber modified asphalt for roads, railway lines, landfill projects, and septic system drain fields. Scrap tires can be bound together and used as different types of barriers including collision reduction, erosion control, rainwater runoff, blasting mats, wave action (protecting piers and marshes), sound barriers between roadways and residences and as a road sub-base, by connecting the cut sidewalls together to form a flexible net. The material is even used in some apparel products, like sandals. Recycled rubber can be also molded with plastic for products like pallets and railroad ties. Shredded tires can be used in roadway landslide repair projects as well as a vibration damping material. Ground and crumb rubber can be used in both paving type projects and in moldable products. Easy-clean surfaces, slip resistance and soundproofing – are a few of the attributes recycled rubber athletic flooring can provide to any recreational area. Tires are also recycled for use on basketball and tennis courts and in new athletic shoe products. Rubber crumb can also be used as infill on grass-like synthetic turf fields. Have you ever wondered what your old tires can turn into?